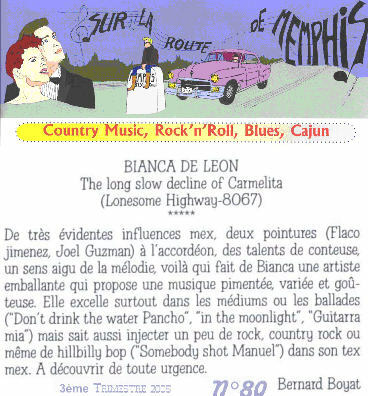 Bianca DeLeon The Long Slow Decline Of Carmelita Lonesome Highway Music CD8067 Bordermusic. De hoesfoto op Bianca DeLeons tweede studioplaat toont de zangeres in de rol van de bezongen Carmelita: een door het leven getekende vrouw met een jurk van zwart kant, een fles drank in de hand. De sfeer van het album is daarmee goed getypeerd: veelal sombere levensverhalen uit het grensgebied tussen Texas en Mexico voorzien van een dito muzikale begeleiding. Ook in een ander opzicht is er nog sprake van een grensgeval. DeLeon klinkt zowel literair en gedistingeerd als volks. Door die spanning is The Long Slow Decline Of Carmelita een uiterst intrigerende cd. Muzikaal gezien staat de plaat in de traditie van Tom Russell en natuurlijk Townes van Zandt, met wie DeLeon overigens een intieme band heeft gehad. Op het zeer indrukwekkende titelnummer speelt Flaco Jimenez mee. Mede daardoor is dat een monument op zich. Verderop vinden we ook nog Teye (Wijnterp). De wat eenvoudig aandoende productie is passend, al vraag je je af en toe af hoe Bianca zou klinken bij een groter label. Al met al een release die indruk maakt en romantische geesten lang zal bijblijven. The sleeve picture on Bianca DeLeons 2nd studio record shows the singer as the Carmelita of the cover song: a woman, branded by life in a black lace dress, a bottle in her hand. The atmosphere of the album is well taken by this picture; mostly dark, sombre life stories from the border of Texas and Mexico with music of the same atmosphere. But she also walks a borderline between being literate and distinguished and folksy. Because of this tension ‘The Long Slow Decline Of Carmelita’ is an extremely fascinating and intriguing CD. Musicaly, the record is made in the tradition of Tom Russell and of course Townes van Zandt, with whom DeLeon had a love relationship. Flaco Jimenez plays the accordion on the very impressive title song. That fact alone makes the song monumental! Further on the album there is also Teye (Wijnterp). That the production feels a bit simple is just appropriate, but you can ask yourself the question how Bianca would sound like on a more important label. All and all an impressive release that will be remembered for a long time by romantic minds. Harmen van Aurich, Heaven Popmagazine 11-1-2006, Momenteel ligt het mooie nr. 1 (2006) in de winkel! Wilt u weten waar het bij u te koop is? Mail naar: bladmanager@heaven.be en u krijgt snel bericht. 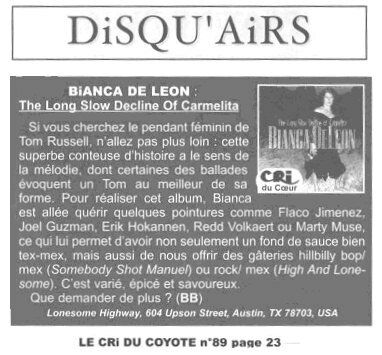 BIANCA DELEON THE LONG SLOW DECLINE OF CARMELITA LIVE : FROM HELL TO HELSINKI Lonesome Highway Music Bianca DeLeon is hoorbaar geïnspireerd door de grote Texaanse artiesten zoals Townes Van Zandt en Guy Clark, met wie ze trouwens de knepen van het vak heeft geleerd. Aan de andere kant klinkt Bianca DeLeon ook behoorlijk country en folky. ”With Joe Ely” staat pontificaal op het hoesje te lezen van haar debuut “Outlaws & Lovers” en enkele aanbevelingen van onder andere Guy Clark en Eric Taylor. In 2002 verscheen haar tweede album, “Live:From Hell To Helsinki” with John Permenter, een akoestisch album live opgenomen voor de Finse radio tijdens haar Europese tour. Tijdens deze tour kon ze rekenen op de romantische viooltonen van J. Permenter. Ook dit album, zoals haar debuut kreeg overal in de pers zeer goede recensies. Die mix van Texas-country met een vleugje Mexicaanse zwierigheid is weer te horen op haar derde album “The Long Slow Decline of Carmelita”, muziek die heel goed te pruimen valt en erg gevarieerd klinkt. Daarbij komt dat Bianca De Leon, beschikt over een lekkere stem; niet donker, niet licht, warm en met voldoende elasticiteit. Ze zet alle ingredienten in om Americana in te kleuren; de pedalsteel, de accordeon en de viool. De ene keer ligt het accent op country de andere keer op rock, folk, tex-mex, swing of Flamenco. Wat me terugbrengt bij het begin. Er spelen weer bekenden mee op deze cd, om aan te geven hoe zeer ze op handen wordt gedragen door collega’s. 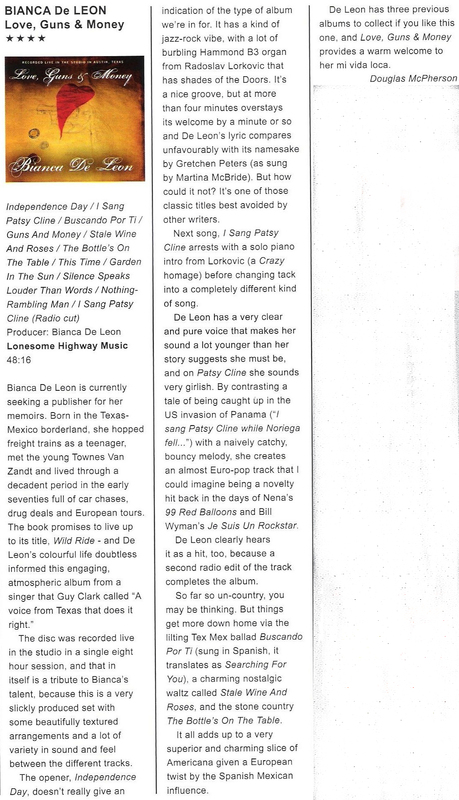 ‘With Grammy winner Flaco Jimenez’ staat op het hoesje te lezen. Bianca DeLeon heeft me wederom verrast op deze plaat en ik ben er nog blij om ook. De sfeer op dit album is vooral ingetogen. De songs van Bianca DeLeon liggen heel lekker in het gehoor – puur genieten. Een cd waarop het ‘s ochtends vroeg lekker wakker worden is en waar je ‘s avond laat bij wegdroomt. Zet hem hard op en je hoort pas hoe goed het allemaal in elkaar zit. Een plaat die bij elke luisterbeurt beter wordt, een werkelijk ijzersterke plaat van deze Texaanse zangeres uit de kring van intimi van wijlen Townes van Zandt. 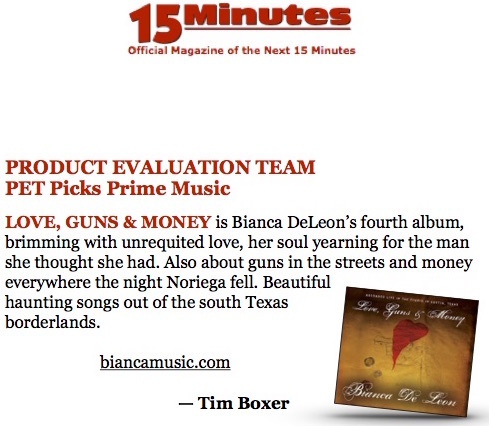 There’s no doubt Bianca DeLeon is very much inspired and influenced by such great Texas artists like Townes Van Zandt and Guy Clark, but on the other side she also puts a big shot of Country and Folk into her music. She got Joe Ely playing as a guest musician on her debut album ‘Outlaws And Lovers’ and got recommendations from colleagues like Guy Clark and Eric Taylor. Her second album ‘From Hell To Helsinki’, recorded live and all acoustic with fiddle player John Permenter at a radio show in Finland became available in 2002 and shows the more romantic side of Bianca DeLeon. As well as the first one this record gets nothing but the best reviews in the press no matter where. 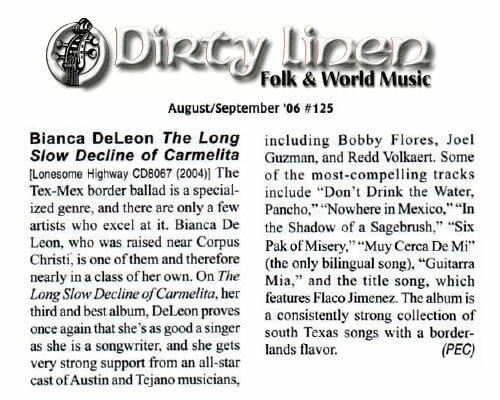 Now on her third release ‘The Long Slow Decline Of Carmelita’ we hear a mixture of Texas country music with a touch of mexican style, music that sounds so well especially because of its variety and the very nice voice of its singer. Sometimes dark, sometimes bright, but always warm and with a high elasticity. And we also have all the ingredients ‘Americana’ needs – pedal steel, accordion and violin, which gives a special tuning to each of these songs. There’s Country, Rock, Folk, Tex-Mex, Swing and Flamenco and once again with Grammy winner Flaco Jimenez she was able to get another heavy weight in the music business by her side. Bianca DeLeon has surprised me once again and I’m very excited about this record, too. The atmosphere is especially modest and the songs are sounding absolutely delicious. A disc for a perfect awake in the morning and to get lost in dreams and thoughts in the evening. Compare it on a high level and you will hear how really good it is at all. An album that becomes better and stronger by each listening to this Texas singer, who surely belongs to the same circle as the late Townes Van Zandt. On “The Long Slow Decline of Caremelita” Bianca does not disappoint her sterling reputation. Every song on The Long Slow Decline… burns with her passionate storytelling, revealing a dark, silky mixture of strength and vulnerability. With truth, depth and grace, Bianca DeLeon brings all her listeners back to her Southwest Texas home, sits them down on the porch and tells them of her experiences. Her new album gives each of us a chance to see her world through her eyes – a world full of dusty roads, shady episodes, and of course, romance. that I am overwhelmed by your Great Great work! The richness of writing and musical diversity give your albums an impression of grand style and of perfection. All the songs are an unusual boldness and richness. You turn what is elementary into something organic, original, immaculate…With fragility and tactfulness, beauty and sensitivity, delicaty and genuineness, you infuse your album with a soul and modesty that can only make it extremely lovable. Your records are not a jewels, but a jewely case, a superb and wonderful jewelly case,for the TRUE JEWEL IS YOUR HEART BEATING INSIDE THE CENTER!! GIANTESS. Being the Dj there,I am also active in the drafting of Country Music Gazette.I would be very happy if I could release for publishing your interview through the Email. For me, songwriters fall into a few different categories. There are the commercial writers, and we need them. There are those people who write to say ‘hey, look at me, this is what happened, and I’m going to tell you about it, minute by painful minute.’ There are a few other categories, but Bianca De Leon falls into one of my favorite slots. She is one of the best at taking a story, be it an afternoon happening, or someone’s entire life and putting it in a song with a huge emphasis on art. Bianca is one of the most artistic writers that I know. So many writers have forgotten that ‘artistic’ is still a viable writing category and this is still an art. Much like one can look at a Monet several times before seeing the painter’s full message, Bianca’s songs are sometimes so artfully done that you might need another listen or even an explanation before you get the entire underlying story. A good song can stand on it’s own without any explanation, but an artistic song can stand on it’s own and still have a larger story that led to the composition. It is evident that the time Bianca spent around Townes Van Zandt influenced her style of laying down a song. There are times I wonder just how much Townes may have learned from Bianca as well. The two have a similar ‘flavor’ to some of their compositions. I’ve only met a handful of writers who truly write from their soul instead of their brains, Townes, Hayes Carl, and Bianca top the list. “Live from Hell to Helsinki” was recorded in Finland, but it’s Texan all the way. “The Long Slow Decline of Carmelita” is a sad tale of a life that just couldn’t catch a break, and indeed is as sad as the story of “Caroline” in Townes Van Zandt’s “Tecumsah Valley”. “Six Pack of Misery” takes the traditional road of a woman scorned by an abusive partner by making good use of a Colt 45, the gun, not the malt liquor. “Outlaws & Lovers” is another example of Bianca’s road tested material and contains a Townes Van Zandt cover ‘Waitin’ Round To Die’. Joe Ely appears on the disk and delivers an excellent performance on ‘Carlos’, while Teye’s flamenco guitar is breathtaking. Bottom line, I’ve known Bianca for years and I’ve never know her to be anything other than a true Texas troubadour. I’m being out on a limb here to say that when we’ve all passed on to the other since, we will be able to look down and see her name added to music’s most impressive lineup, the Texas Music Hall of Fame. If you’re talking about Texas music and you don’t find yourself taking about Bianca De Leon, you’re in the wrong conversation. Återigen ett fynd i en av dessa högar som belamrar mitt vardagsrum. Ett fynd av den kaliber att övriga fredagsaktiviteter som städning och matlagning får vänta. Jag kan inte lämna min position i bästa soffan och min bättre hälft må ursäkta mig. Detta verk är inspelat live i studio, med endast ett fåtal pålägg i efterhand. Tempot var högt, elva låtar på åtta timmar. Lägstanivån kanske ligger lite lägre om man lyssnar riktigt noga, men å andra sidan är högstanivån (ganska många låtar) magisk. Texanska singer/songwriters kan konsten att berätta om livet som det är, även när det smärtar, vilket det utan tvekan gör ibland. Men musiken är en helande kraft i Biancas liv. Country, absolut. Och riktigt bra av just den här typen som gör sig bäst när man vill lyssna och inte bara höra. Again a bargain in one of these piles cluttering my living room. The findings of the caliber that other Friday activities like cleaning and cooking will have to wait. I can not leave my position in the best couch and my better half may excuse me. This work was recorded live in the studio, with only a few toppings afterwards. The tempo was high, eleven songs in eight hours. Minimum level maybe is a bit lower if you listen carefully, but on the other hand, the highest level (quite a few songs) magic. Texan singer / songwriters, art can tell about life as it is, even when it hurts, which it undoubtedly does sometimes. But music is a healing force in Bianca’s life. Country, absolutely. And really well by just this kind that is best when you want to listen and not just hear. 4.0 out of 5 starsToo Good To Be Left Lonely Without A Notice! My immediate impression of this well crafted, sincere disc, is that it’s going to be a real grower. The lights never do seem to go out for good music in Austin, Texas and Bianca presents herself with confidence,earthy songs, and a crackling band. Definitely worth checking the samples out to see if this fine recording grabs your “from the heart” folk/country with a little bite ear! Buen Suerte! Nata a Corpus Christi nel sud del Texas, Bianca si considera un incrocio tra una zingara americana, una cantastorie texana e una cantautrice. Ha pubblicato quattro dischi, compreso un live ad Helsinki, alternando influenze tex-mex e folk-rock, ma è più conosciuta in Nord Europa che negli Stati Uniti (escluso il Texas). Dotata di un voce melodica e accattivante che si adatta anche ai brani più ritmati e accompagnata da alcuni dei migliori musicisti locali come John Inmon alla chitarra (visto recentemente con Jimmy LaFave), Radoslav Lorkovic alle tastiere e Paul Pearcy alla batteria (Dixie Chicks, Willie Nelson), Bianca ha registrato dal vivo in studio a Austin un disco molto vario e interessante, alternando brani di ispirazione country come il singolo I Sang Patsy Cline e The Bottle’s On The Table, ballate cantautorati quali la dolente Independence Day e Stale Wine And Roses (nella quale la voce ricorda Margo Timmins dei Cowboy Junkies), il tex-mex di Buscando Por Ti e della sofferta This Time con il sax di Donny Silverman e il roots-rock malinconico di Guns & Money impreziosito dalla fisarmonica di Lorkovic. In chiusura c’è un forte richiamo alle radici texane con un pregevole medley di Nothin’ (Townes Van Zandt) e Ramblin’ Man (Hank Williams). Disco interessante di un’artista che potrebbe ottenere buoni riscontri anche dalle nostre parti. Born in Corpus Christi in South Texas, Bianca is considered a cross between an American Gypsy, a storyteller and a Texan singer-songwriter. She has published four albums, including a live in Helsinki, alternating Tex-Mex influences and folk-rock, but is better known in Northern Europe and the United States (excluding Texas). Equipped with a melodic and captivating voice that is also suitable for the more rhythmic songs and accompanied by some of the best local musicians like John Inmon guitar (seen recently with Jimmy LaFave), Radoslav Lorkovic on keyboards and Paul Pearcy on drums (Dixie Chicks, Willie Nelson), Bianca has recorded live in the studio in Austin a very varied and interesting album, alternating inspirational songs country as the single I Sang Patsy Cline and the Bottle’s on the Table, ballads such as sore Independence Day and Stale Wine and Roses (in which her voice recalls Margo Timmins of the Cowboy Junkies), the Tex-Mex Buscando Por Ti and painful This Time with saxophonist Donny Silverman and melancholic roots-rock of Guns & Money embellished by Lorkovic accordion. In closing there is a strong reminder of her Texan roots with a fine medley of Nothin ‘(Townes Van Zandt) and Ramblin’ Man (Hank Williams). An interesting record from an artist who could also get good feedback from our parts. 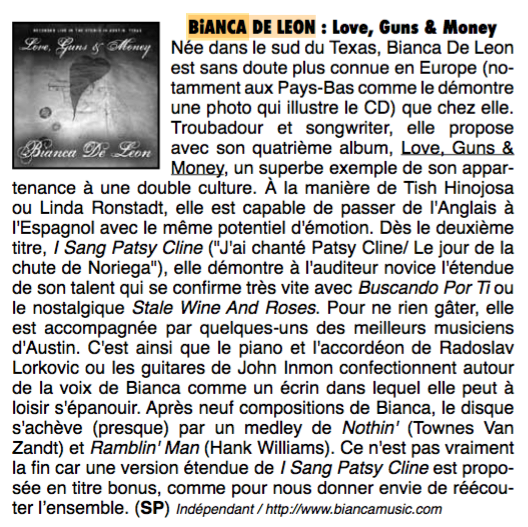 Reviews By Stephen Rapid SATURDAY, JULY 9, 2016 AT 02:35PM Bianca De Leon Love, Guns & Money Self Release Self-written and produced album number four from De Leon (other than the one cover Nothin’/Ramblin’ Man which combines songs by Townes Van Zandt and Hank Williams). It was recorded in Austin, Texas with some local players stepping up to the plate. Names know to those who check such things on albums coming out of Austin like John Inmon, Paul Percy and some, not so well know perhaps, like Radoslav Lorkovic on piano, B3 and accordion (he also plays with Jimmy LaFeve and others)- an instrument that adds much to the atmosphere of the song Guns And Money. De Lone has a strong versatile voice that is the centrepiece of the material here. For her fourth album she handles the production herself and gets a strong, textured and varied sound from her assembled players. Some of the songs really evoke a time and place such as I Sang Patsy Cline. A song that details the background to the title which was about the night that Manuel Noriega was removed from power in Panama. It appears in an extended 6-minute version and as a bonus track at the end of the album as a radio edit. To underline her affinity and heritage, Buscando Por Ti is sung in Spanish and is about looking for love. Stale Wine and Roses is about leaving and being left behind and is delivered with a softness that echoes of regret. The Bottles On The Table, which features some effective playing from Lorkovic on piano and the East Side Flash on resophonic guitar and some string harmony vocals, has a similar sense of unresolved emotions. The remainder of the album is equally effective and the songs bear repeated listening and the printed lyrics allow for closer inspection and therefore the meaning of the songs though relationships gained and lost are central to the songs. Garden In The Sun has another nice harmony from Hilary Claire Anderson. It is also a more acoustic-based song that considers offering a place of refuge. Nothin’/Ramblin’ Man fits well into the overall scheme of things by sounding completely in sync with the self-written songs. They are tributes to two writers who have likely provided much inspiration to De Leon. Silence Speaks Louder Than Words is an expression of a universal truth which again underscores that De Leon is a writer and singer of note who has produced an album that works on several levels and is the work of a person who has lived some life to get to this place. A place worth getting to. 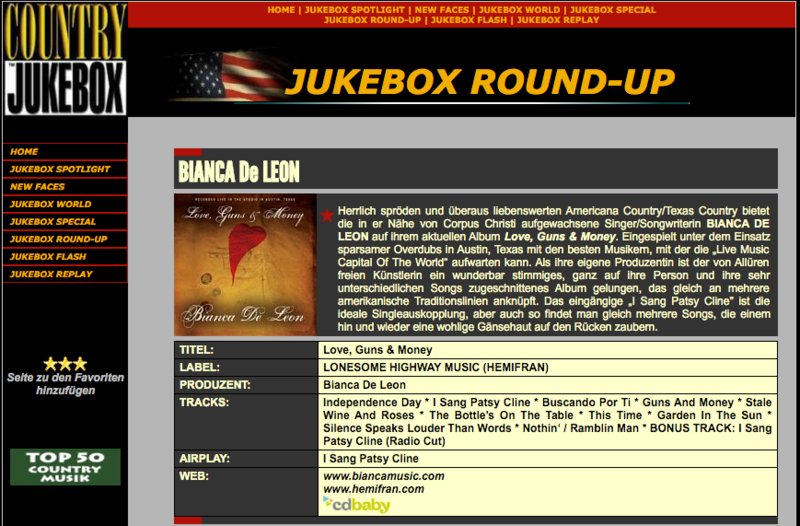 BIANCA DELEON – LOVE, GUNS & MONEY Wow, dat was alweer even geleden! Ik bedoel dat we lange tijd niks te horen kregen over deze heel bijzondere dame, die nu toch al vijftien jaar geleden door de zeer grote poort ons muzikale leven kwam binnengezwaaid met de ronduit fantastische “Outlaws & Lovers”-plaat. In het zog van mensen als Tish Hinojosa, bracht zij ons dat tikkeltje meer uit de muziek van het zuiden van de staat Texas. Ze had haar naam mee, schreef enkele heel knappe nummers en wist haar covers zorgvuldig uit te kiezen. Die plaat bracht haar ondermeer naar onze Lage landen en naar Scandinavië en dat touren resulteerde in de goeie “Live from Helsinki”-CD uit 2002? Twee jaar. later volgde nog de wat minder opvallende “The Long Slow Decline of Carmelita”, die niet geheel onbegrijpelijk tussen de plooien van de tijd verzeild geraakte….. Wie ooit een concert van Bianca zag, weet ongetwijfeld wat ik bedoel: deze dame heeft het vermogen om je, al zit je ergens in Nederland naar haar te kijken en te luisteren, het gevoel te geven dat je helemaal in Texas zit. Dat heeft natuurlijk te maken met het feit dat er bij haar al eens een Spaanstalige song passeert (al is er hier maar ééntje, namelijk “Buscando Por Ti”), maar vooral met die sfeer. Je kunt dat moeilijk met woorden beschrijven, maar er is iets met Texas en al helemaal met het Texas van de songwriters. Als songwriter is Bianca duidelijk tot volle wasdom gekomen: ze beheerst zowat elke stijl, die je onder de noemer “Americana” kunt klasseren en ze laat zich ook nog eens omringen door een groep klassemuzikanten, van het gehalte John Innon, Stuart Adamson, Paul Pearcy en Rad Lorkovic, om slechts die vier bij naam te noemen. Op de plaat dus tien nummers, of elf, als je de reprise van “I Sang Patsy Cline” meerekent. Of nee, twaalf, als je de medley van “Nothin’” van Townes van Zandt en “Ramblin’ Man” van Hank Williams voor de twee songs neemt, die het ook wel zijn. Enfin, voor we in oeverloze discussies vervallen: dit is ruim drie kwartier Amerikaanse rootsmuziek van hoog niveau, of je ‘t nu “singer songwriter” of “Americana” of Folk” of “Country” of “Border music” noemt. : dit is een heel gevarieerde CD, met een rijpe songschrijver en een goede zangeres in de focus. Deze dame schrijft, zo denk ik, nogal vaak vanuit eigen ervaring en dat kun je horen: dit is geloofwaardig, dit klinkt doorleefd, dit gaat recht naar het hard en daarenboven is het ook nog eens goed gespeeld. Veel meer moet dat voor ons niet zijn en als het haar belieft, mag Bianca gauw nog eens onze kant uit vliegen! 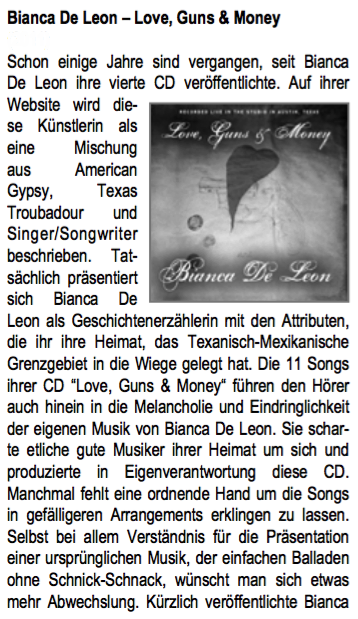 — (Dani Heyvaert) “Bianca De Leon is a Texan singer-songwriter that writes lyrics based on personal experiences which are heartfelt and moving. On her latest album ‘Love, Guns & Money’, this great singer delivers Americana songs in English and Spanish language that remind of other female stars originating from Texas, e.g. Tish Hinojosa.” http://www.rootstime.be/index.html?http://www.rootstime.be/CD%20REVIEUW/2016/MA1/CD70.html This link will refresh to Bianca’s review. Wow, that was been a while! I mean we heard nothing for a long time got over this very special lady, now already fifteen years ago by the huge port our musical life came swung the downright fantastic “Outlaws & Lovers” plate. In the wake of people like Tish Hinojosa, they brought us that little bit more out of the music from the south of the state of Texas. She had her name with it, wrote some really great songs and was able to choose its cover carefully. That album brought her to include the Low Countries and Scandinavia, and touring resulted in the good “Live from Helsinki” CD from 2002? Two years. later, even the less conspicuous “The Long Slow Decline of Carmelita” who did not get completely incomprehensible caught up in the folds of time. And now there’s so number four, which I can give right away that it worth the wait… this has become a very fine record, recorded completely live in barely eight hours of time and so there is plenty of live feeling. Who ever saw a concert by Bianca undoubtedly know what I mean, this lady has the ability to you, though you’re somewhere in the Netherlands to look at her and listen, to give the feeling that you do is in Texas. That has to do with the fact that its once pass a Spanish language song (though there’s only one, namely “Buscando Por Ti”), but especially with that atmosphere. You can describe it in words is difficult, but there’s something about Texas and certainly with the songwriters Texas. 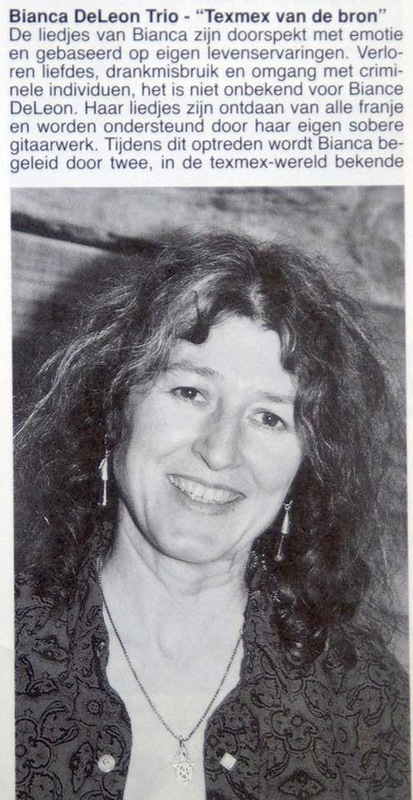 As a songwriter is Bianca clearly reached maturity they mastered just about every style, which can be classified under the “Americana” denominator and she let herself once again surrounded by a group class musicians of the content John Innon, Stuart Adamson, Paul Pearcy and Rad Lorkovic, to mention only those four by name. On the plate is ten numbers or eleven, if you have the reprise of “I Sang Patsy Cline” know more. Or no, twelve, when the medley of “Nothin'” Townes van Zandt and “Ramblin’ Man” by Hank Williams taking the two songs that do it also. Anyway, before we fall into endless discussions: This is more than three-quarters of American roots music of a high standard, whether you think it now calls “singer-songwriter” or “Americana” or “Folk” or “Country” or “Border Music “. This is a very varied CD with a mature songwriter and a great singer in focus. This lady writes, I think, quite often from their own experience and that you can hear that this is credible, this sounds lived, this goes right to the hard and above it is also a good play. Much more must be not for us and if it pleases her, Bianca may soon fly again from our side! — (Dani Heyvaert) http://www.rootstime.be/index.html?http://www.rootstime.be/CD%20REVIEUW/2016/MA1/CD70.html This link will refresh to Bianca’s review. Zowat alle tracks werden samen met de begeleiders in nauwelijks acht uur ingeblikt in de studio in Austin. Enkel de resonerende dobro, een deel van de achtergrondzang en de saxpartijen, zoals in het slepende This Time, werden nadien toegevoegd. Het repertoire van Bianca is opgebouwd met borderballades, een specifiek genre waarin DeLeon haar klasse etaleert met prachtige zang. Weemoedige verhalen over liefde en het verlies van dat gevoel waarbij meestal de plaatselijke cantinas en kroegen het decor vormen en de gebroken harten ergens in donker hoekje schuilen om hun wonden te likken. Silence Speaks Louder Than Words. 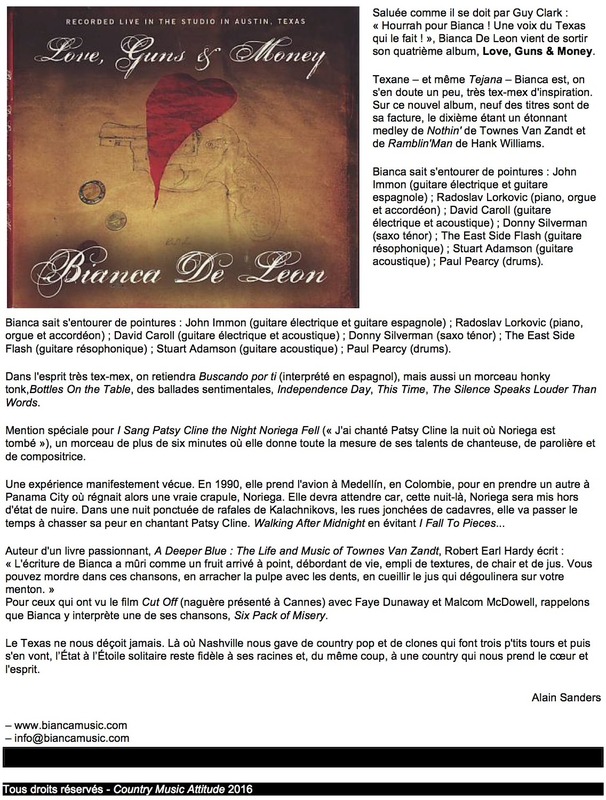 “I Sang Patsy Cline the night Noriego falls” vertrouwt de zangeres ons toe. 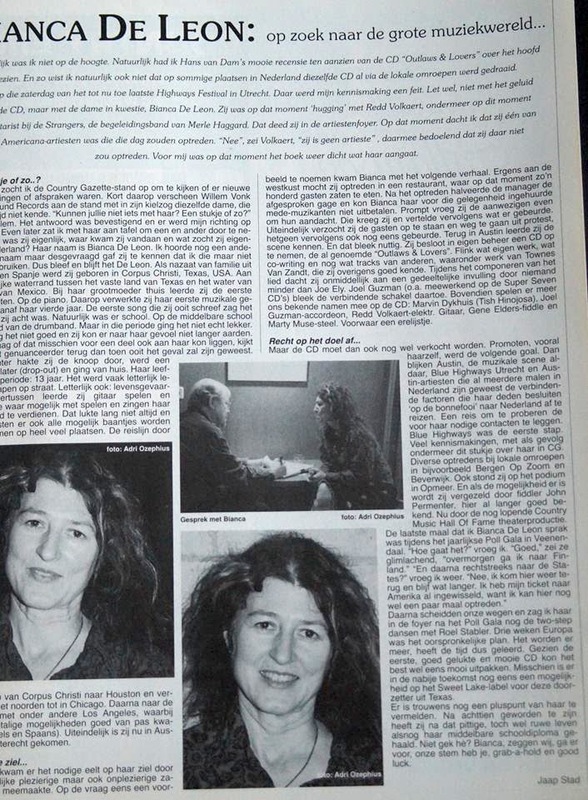 Het beklemmende getuigenverslag van Bianca over de dramatische gebeurtenissen in Panama in 1990, toont de intrinsieke klasse van de zangeres als songwriter. De gestileerde afbeelding van een AK-47 Kalasjnikov op de cd verwijst naar dat persoonlijke relaas. Ter afsluiting diept ze klassiek werk op van gereputeerde collega’s en brengt Townes Van Zandts, Nothing, een uitgebreid klaaglijk epos met trillende, overslaande stem dat vanaf de eerste gezongen noot beklijft en naadloos overgaat in Ramblin’ Man, dat andere poor whiteman’s blues monument van Hank Williams. Niet zonder risico die coverkeuze maar als je vlak daarna de reprise van I Sang Patsy Cline beluistert kan je er niet omheen, Bianca De Leon is een niet te onderschatten songstress. http://www.writteninmusic.com/roots/bianca-deleon-love-guns-money/ Nearly the title of the Warren Zevon song “Lawyers, Guns and Money” from Excitable Boy in ’76, our interest was immediately aroused. Bianca De Leon visited incidentally already our region; on the photo of the back of the digipack she poses for a placard with a concert announcement in Dutch. When she’s not living on the road, De Leon is on the border between Texas and Mexico. Which border they cross musical ever to witness the Spanish “Buscando Por Ti” which like “The Bottle’s On The Table” in jaunty accordion tones rolled over. The twang income stringed instruments of the acclaimed John Inmon also beside the Spanish guitar, the stem with verve bepotelt. Nearly all the tracks were combined with the supervisors in barely eight hours canned in the studio in Austin. Only the resonant dobro, a part of the song and the background saxpartijen, such as in the trailing “This Time”, were added subsequently. The Bianca repertoire is built with border ballads, a specific genre DeLeon showcases her class with beautiful vocals. Wistful tales of love and loss of that feeling which usually form the local cantinas and bars the decor and broken hearts hide somewhere dark corner to lick their wounds. “Silence Speaks Louder Than Words”. “I Sang Patsy Cline the night Noriega fell” the singer confides to us. The oppressive witness report Bianca on the dramatic events in Panama in 1990, shows the intrinsic class singer and songwriter. The stylized image of an AK-47 on the CD refers to the personal account. In conclusion deepened her classic work of reputed colleagues and bring Townes Van Zandt’s, “Nothing”, rich plaintive epic trembling, his voice which lasts from the first sung note and flows seamlessly into “Ramblin’ Man” that other poor white man’s blues Memorial Hank Williams. 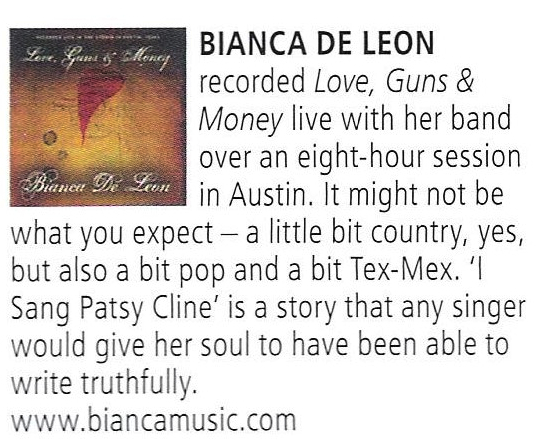 Not without risk which cover choice but if you are just after the revival of “I Sang Patsy Cline” listen you can not avoid, Bianca De Leon is not to be underestimated songstress. There are some of those things that you always can come to us are equally troublesome. Things like a new CD of the “queen of the border ballad” for example. From whom, you asked? The “queen of the border ballad” !Bianca DeLeon! The Texan songwriter which the legendary Guy Clark years ago declaimed “A voice from Texas That does it right!” And so it is in our opinion only just! 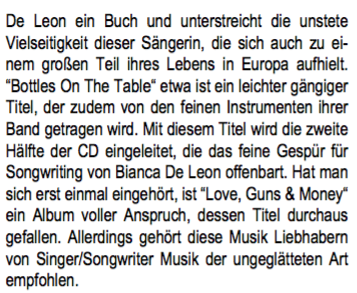 With “Love, Guns & Money” DeLeon is already on her fourth album. And like its predecessors it she convinces that new again fully. In the footsteps of colleagues such as Willie Nelson, Townes Van Zandt, Tom Russell, the already mentioned Guy Clark and others she explores ten tracks long border area between her home country and Mexico. And that results in the company of gifted fellow travelers as John Inman (guitar), Stuart Adamson (acoustic guitar), Radoslav Lorkovic (piano, B3 and accordion), The East Side Flash ( resophonic ), Paul Pearcy (drums and percussion) and some others once again a lot of musical delights on. The truly just a rock vibe surfing “Independence Day” on the spring fresh rootspop storytelling “I Sang Patsy Cline (The Night Noriega Fell)” to border ballad (A yeah, hey!) “Buscando Por Ti,” the twangy honky-tonker “Guns & Money” about it roll gradually slow way across a hardwood dance floor and “Stale Wine and Roses” to the “tears in your beer” from “The Bottle’s on the Table”, the atmospheric Americana of “This Time” and “Garden In the Sun” on it gently, almost timidly beyond shuffling” Silence Speaks Louder Than Words” to the closing medley of “Nothin ‘” by the late Townes Van Zandt and Hank Williams’ “Ramblin’ Man” and on the last moment as a bonus track on the whole added radio cut of “I Sang Patsy Cline,” we can have no difficulty finding anywhere here. Love it! 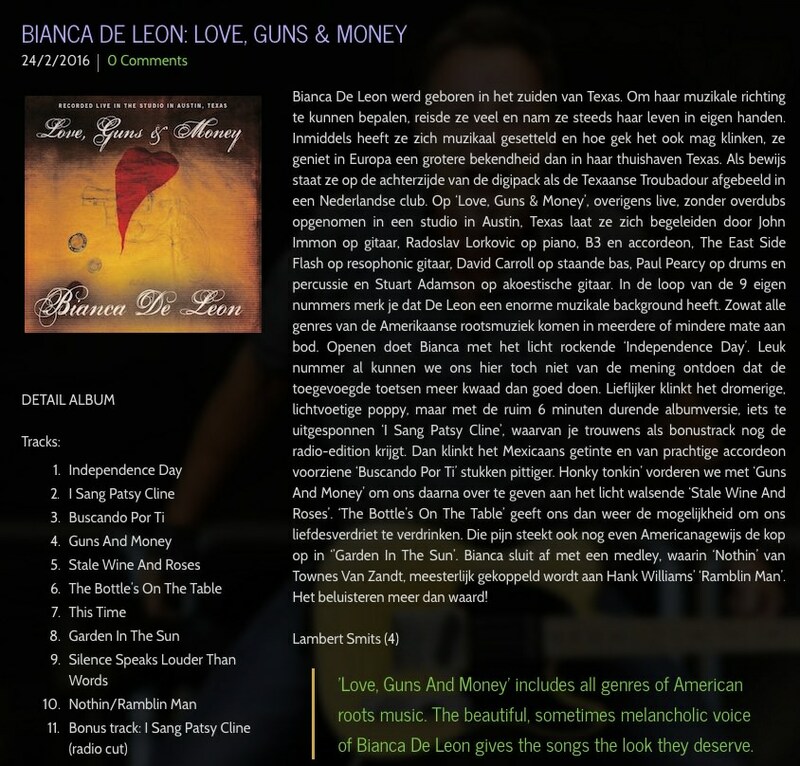 Bianca de Leon – Love, Guns & Money (Waardering Muziekwereld) 8 Met Love, Guns & Money is Bianca de Leon inmiddels al aan haar vierde album toe. En net als op de voorgangers overtuigt ze ook op die nieuwe weer volop. In de voetsporen van collega’s als Willie Nelson, Townes Van Zandt, Tom Russell, de al genoemde Guy Clark en anderen verkent ze tien nummers lang het grensgebied tussen haar thuisstaat en Mexico. En dat levert in het gezelschap van begenadigde medereizigers John Inman (gitaren, Stuart Adamson (akoestische gitaar), Radoslav Lorkovic (piano, B3 en accordeon), The East Side Flash (resophonic), Paul Pearcy (drums en percussie) en nog wat anderen ook nu weer flink wat muzikale hoogstandjes op. Van het voorwaar even op een rock vibe surfende Independence Day via het lentefrisse rootspop-opstootje I Sang Patsy Cline (The Night Noriega Fell) tot border ballad (A ja, he!) Buscando Por Ti, van de twangy honky-tonker Guns & Money via het zich walsgewijs traag een weg via een hardhouten dansvloer banende Stale Wine And Roses tot de “tranen in je biertje” van The Bottle’s On The Table, van de sfeervolle Americana van This Time en Garden In The Sun via het zachtjes, bijna bedeesd voorbij schuifelende Silence Speaks Louder Than Words tot de afsluitende medley van Nothin van wijlen Townes Van Zandt en Hank Williams’ Ramblin’ Man en de op de valreep nog als bonus track aan het geheel toegevoegde radio cut van I Sang Patsy Cline, wij kunnen ons hier probleemloos overal in vinden. Several years have passed since Bianca De Leon their fourth CD released. 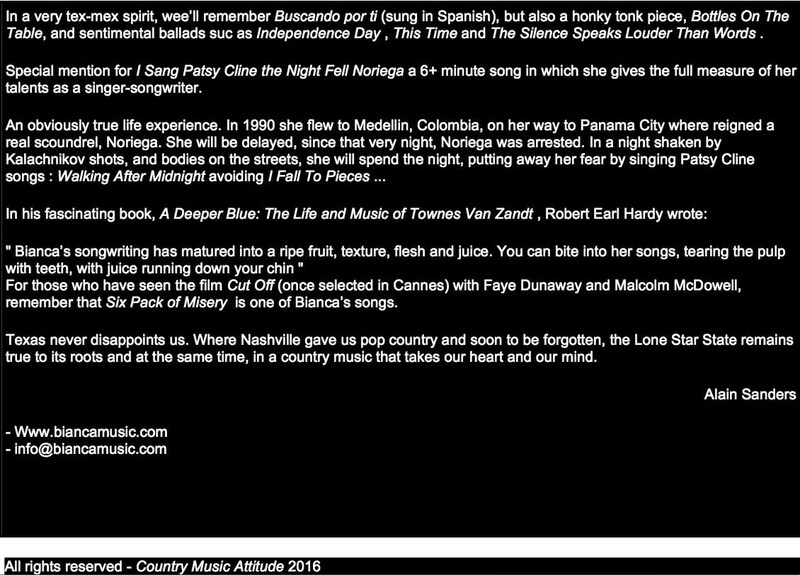 On your Website is this artist as a mixture from American Gypsy, Texas Troubadour and Singer / Songwriter described. Indeed presents Bianca De Leon as a storyteller with the attributes, her their home, the Texan-Mexican Border area has in the cradle. 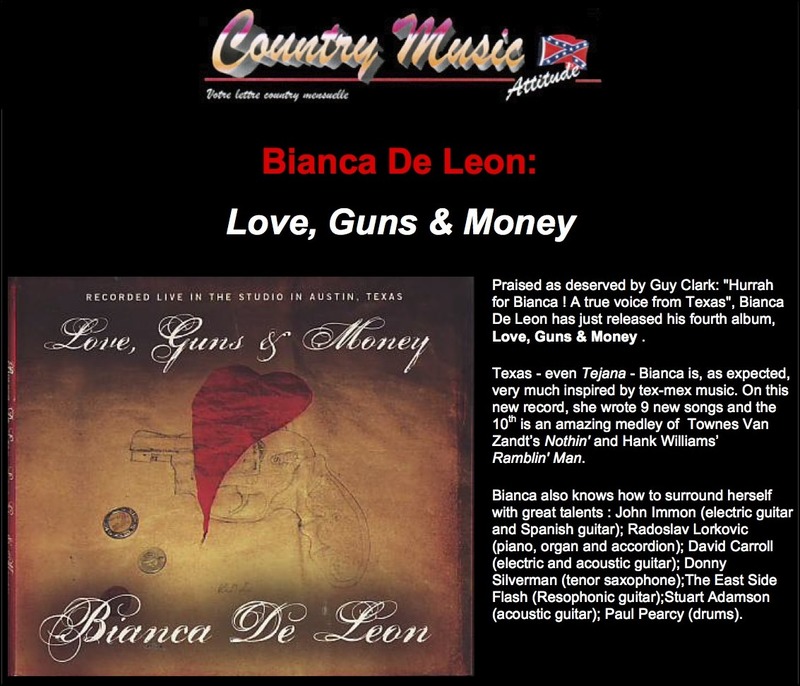 The 11 songs their CD “Love, Guns & Money” lead the listener also into the melancholy and urgency their own music by Bianca De Leon. They gathered many good musicians of their homeland around and produced in ownership this CD. Sometimes missing a regulatory hand to the songs sounded to in pleasing arrangements. Even with all due respect for the presentation an original music, the simple ballads no-frills, one wishes for something more variety. Recently published Bianca De Leon a book and emphasizes the erratic Versatility of this singer, who also is a resided most of their lives in Europe. “Bottles On The Table” about is a slight common Title, which also her of the fine instruments Belt is worn. This title is the second Half of the CD initiated, for the fine sense Songwriting by Bianca De Leon disclosed. One has is once turned hears is “Love, Guns & Money” an album of claim whose title perfectly like. However, this music belongs lovers Singer / songwriter Music of unsmoothed Art. Recommended.